We’re so excited to be celebrating our 12th Birthday! Throughout the special 10 day event, we’re giving you the presents with exclusive free gifts! Order and you’ll also receive exclusive goodies designed by Sara Davies. Collect Sara’s ‘Floral Fantasy’ Signature Collection when you spend over £50 or £100 in one transaction during the event. Spend over £250 (in one transaction) and receive the entire collection for FREE! To show you just what you can do with this amazing collection, keep on reading! Gently rub the transfer sheet with the lollipop stick being careful not to rip the tissue paper around the edges. Leave the transfer sheet in place and turn the tissue paper over. Using your Spectrum Noir Pens gently colour in the flower petals and leaves. Be very gentle and just lightly touch the pens against the tissue paper. You do not want to flood the area or the tissue paper will break. Start with your lighter colour and then add the darker one on top. You will not be able to blend in the traditional way so keep looking at the right side of the tissue paper to see if you are happy with the colours. When you have finished colouring cut the piece of tissue paper down so that it leaves approximately a 1cm edge around your design. Remove the transfer sheet and place a piece of foil on top of the tissue paper. Gently rub the foil and peal back slowly to reveal your design. Put a small dab of glue onto the corners of the tissue paper and position it onto your candle. The glue will help it stay in place. Add a sentiment, again using tissue paper. Take a piece of wax paper and wrap it around your candle. You will need a long enough piece to be able to hold onto. You will need to be fairly quick with this next part to ensure the wax paper doesn’t get stuck to your design. Using your heat gun heat the area on and around your designs. You will notice that the wax from the wax paper will start to melt and will have a sheen like appearance, keep going until you have heated around all of the design. Gently peel back the wax paper. The tissue paper should have melted onto the candle completely but if you find you have any areas that haven’t just reapply your wax paper and reheat this section. Top Tip – If you find any wax paper has stuck to your design just gently reheat the area with your heat gun to release it. 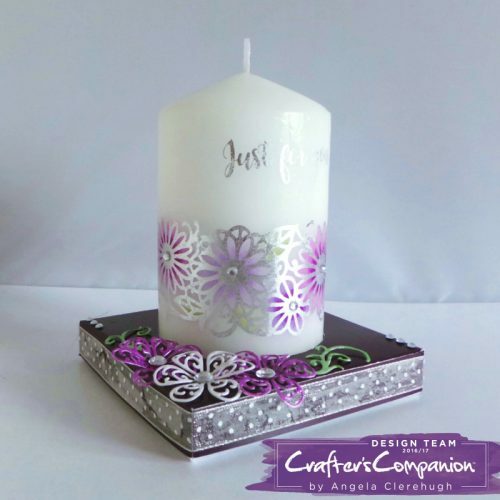 If you would like to make a base for your candle you can do so by using the packaging that comes with your Foils & Transfers and a piece of Centura Pearl Card. Take the purple card and either die cut a circle in the centre or draw a circle and cut it out (use the candle to draw around to get a perfect size). Make up the box and decorate and place your candle inside. Top Tip – If your candle is sitting too low you can layer a couple of piece of card inside the box to give it a little more height. Don’t forget to spend with us throughout our birthday celebrations to receive your free goodies!